MazdaSpeed 3/6 - ECU Computer Tuning Have an ECU tuning issue? Do you want to discuss Mazdaspeed 3/6 tuning solutions? Up to date info on the latest! Piasini Reflash, Cobb Access Port, Xede, Procede, Standback, Superchips & others supported here! So, I was looking at the spicy ms3 tune and took some tips from it to get a drag stip tune for my ms6. turned out pretty well, some fluctuations in actual fuel pressure, but yeah. The other dyno is from my 5gal e85 tune. Fluids Transmission - Motorcraft synthetic. PTO and Rear diff - Conklin Gold Guard Plus synthetic 75W-90. Engine Oil - Rotella T6 5W-40. I'm absolutely loving this tune, although, gas mileage is baaadd, 200 miles for 14.5 gallons, goina be crazy when I get my gtx3071. I'll be going to the track tomorrow so I'll be posting 1/8th mile times. SC fails at having 1/4 mile tracks. Edit, after reading more, my actual fp is not stable because of the fr relief valve, I'll have to look at getting the ptp upgraded one. Really hoping it doesn't rain at the track though. Last edited by thehead; 03-25-2012 at 06:13 AM. DO NOT RUN THIS TUNE FOR DAILY USE. Just lower your Di fuel pressure to 1800 and that will keep the relief valve happy. omg this is retarded. Stop running this tune retard. don`t worry we will find out soon(zoom, zoom, boom thread) if he was running that map daily.G/L hopefully you won`t bite the dust, we have tooooo many speeds going zoom, zoom boom lately don`t part of the club. Hmm ... not a huge fan of the lean AFRs - are you running E85 or race fuel? 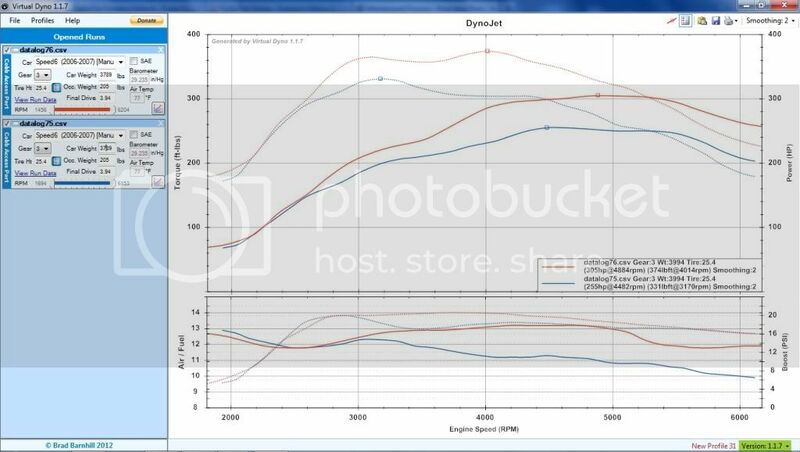 With an E85 tune you should be able to squeeze around 400 ft lbs and closer to 320-330whp on a Vdyno. Of course I have no idea under what conditions that log/vdyno was taken. Doesn't it take 50 miles to settle in a new map anyway? 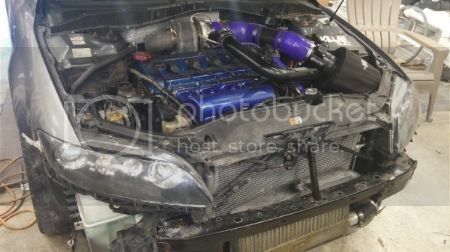 That's what I heard about in that thread regarding the MS6 getting tuned on it's 2nd motor, and blew it again. It takes like 50 miles for it to learn the fueling but at WOT the fueling is set in the map already I believe. There should be no need to let the car learn the fueling for regular driving seeing as this is a very dangerous map to run on the car daily.